On arrival, I was greeted by a glamorous air hostess who, handing me my baby pink passport, welcomed me aboard 'Revlon Airways' and sent me through not a normal door, but an aircraft plug door. 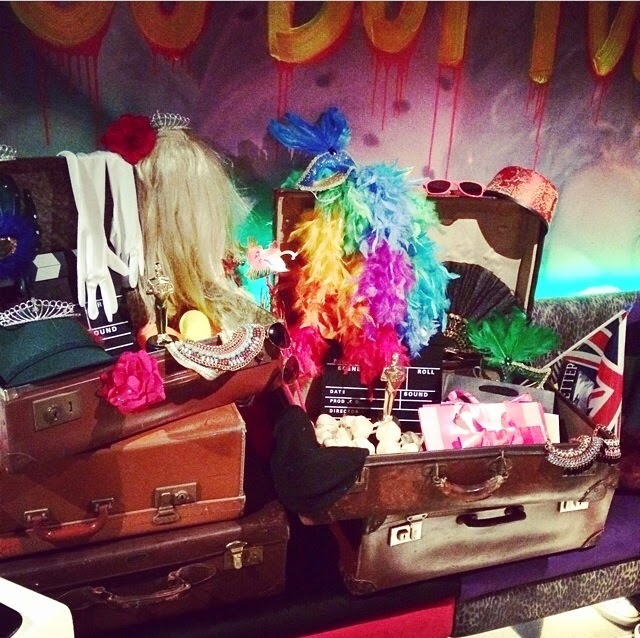 I was feeling the 'jet set beauty' theme already and I hadn't even entered the venue yet! 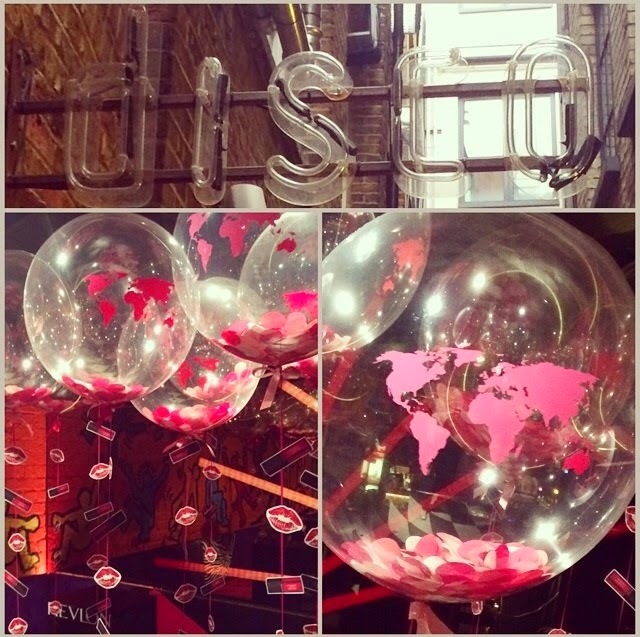 Held at Disco in Kingly Court, Soho - where "70s Manhattan is reborn" - the club had been decked out with Revlon prettiness from the floor to the ceiling. With a cocktail in hand, I was given an around-the-world tour of the new ColorStay Moisture Stains, created with global art director and all-round babe, Gucci Westman. As the products 'take inspiration from the world's hottest cities', the event had been designed to suit that vibe perfectly and the dance floor held twelve different stands, each representing an iconic destination with miniature versions of famous landmarks and props that epitomised the city. Here's me in true patriotic style with the shade 'London Posh' and the cutest miniature Big Ben, red phone box and Union Jack - adorable! In our Revlon passports was a page for each Moisture Stain and space to collect stamps from our globe-trotting adventures - my favourite was 'India Intrigue' with a little Taj Mahal. Even the e-mail invitations were travel-themed as Revlon Airways boarding passes. Love! After my tour around the world and hearing about ASOS and their exclusive collection that's launching in celebration of the ColorStay Moisture Stains - keep your eyes peeled for that one - one of Revlon's talented artists led me to her chair and did my makeup, applying the lip colour of my choice - which was 'Rio Rush', a bright and peppy hot pink. Having a chat over our cocktails with the lovely Nisha Grace (find her on Twitter here), we snapped photos of each other making good use of the fancy dress box - think feather boas, plastic pink flamingos and hats of all shapes and sizes - and uploaded them to Instagram with the hashtag #jetsetbeauty so that they could be printed out on Revlon's photo booth. 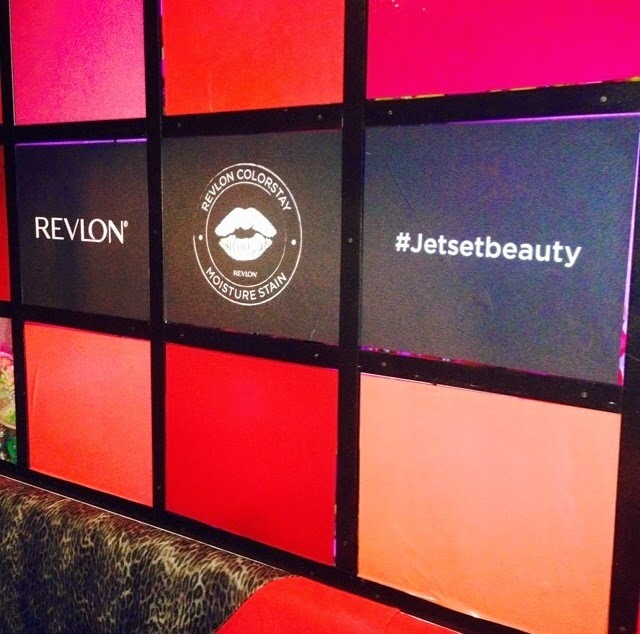 Be sure to search for 'jetsetbeauty' on Instagram to see all of our pictures! Upon leaving the venue departing from the airport I was given a glossy black Revlon goodie bag as a thank you for attending, which contained a selection of the beautiful Moisture Stains and to my surprise, a gorgeous passport cover from Aspinal of London. Talk about generous?! I couldn't thank them enough for inviting me, I had a truly amazing time and am so in love with the new lip products - and I'm sure you all will be, too! I then caught the tubes to London Liverpool Street and headed home after a whirlwind two days, feeling extremely worn out but extremely appreciative after such a fun trip. On Friday I had to giggle, as I was in my pyjamas watching re-runs of Ramsay's Kitchen Nightmares with my hair in a pineapple and the day previously I'd been at an exclusive event for one of the world's biggest beauty brands rubbing shoulders with the likes of ELLE magazine - the life of a chronically ill blogger, hey? Keepin' it real. I'll be writing a full review of the ColorStay Moisture Stains (with swatches!) very soon, and - calling all lippy lovers - they'll be launching in August 2014. Let the countdown begin! Will you be trying the Moisture Stains when they launch in the UK? Oh my goodness, sounds like the most amazing time. So glad you got to go out and do something so fabulous. Seriously need that deep purple shade! Oooh you lucky thing, I'm so jealous! Can't wait to read the full review and will probably be buying the stains in a couple shades when they come out! These look so cool and so many of the shades catch my eye. The packaging is so sleek and unique! Ohh my gosh girl, I am beyond jealous! And I am sure I will be trying these, how can I ignore such pretty colours?! Such a lovely event and I can't wait to get my mits on one (any guesses for which colour I'll be opting for?) 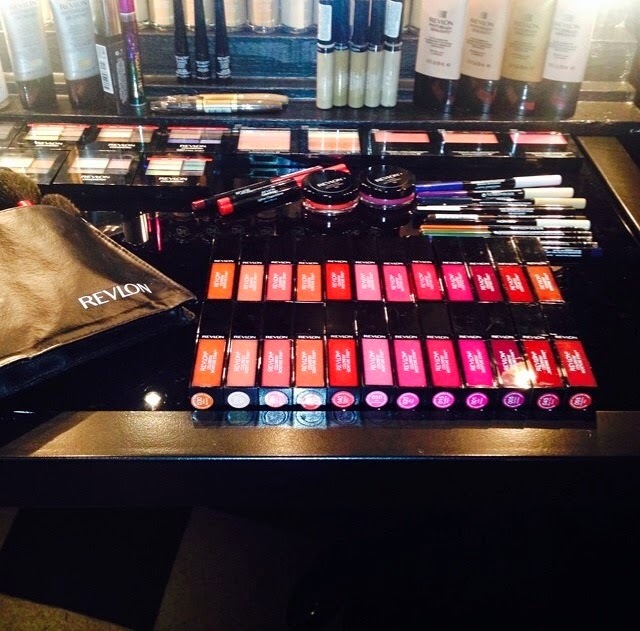 The Revlon Airways ticket is so great! This looks and sounds amazing! I wish I was able to go! This sounds like the best ever, I'd love to go to an event such as this. These products look great, amazing shades. We just want all of the colors and so jealous that they aren't even out yet. Hope you enjoy them to no end Meg!